A handy and safe way to lift and spot heavy loads for welding, assembly, or general material handling. Total 360° rotation for extra versatility. Super-strength steel construction for industrial use and years of trouble-free service. 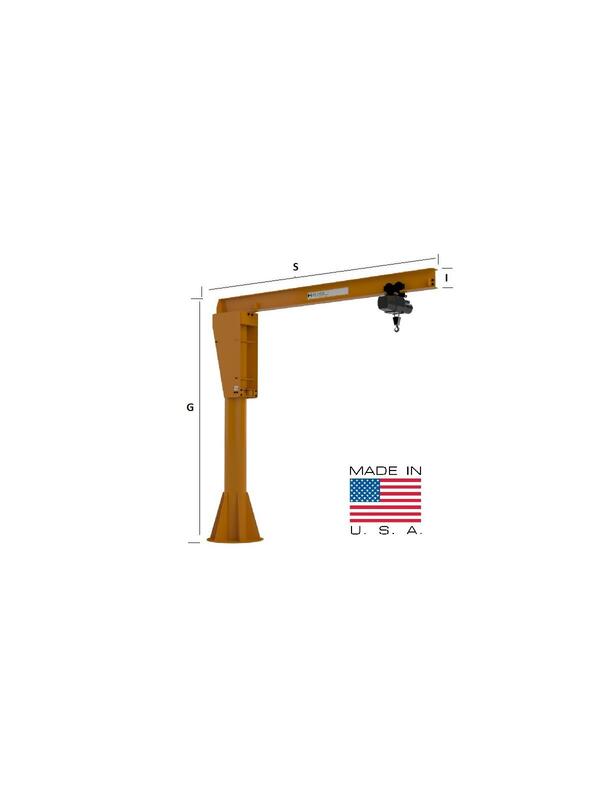 Designed as a self-supporting jib crane for mounting on floor or foundation. Withstands bending stresses without undue deflection to boom. Pipe is reinforced with heavy base gussets and mounted on heavy base plates. Jib head is constructed of two heavy side plates with reinforced plates to permit balancing of stresses. Girder is equipped with removable end stops and contains proper mount provisions for connection to jib head. Slide thrust roller is mounted in a heavy duty machined carriage weldment. Jib crane design incorporates safety features to prevent removal of head under accidental heavy impact application. Yellow enamel finish. Consult us for foundation requirements. FOB Shipping Point. Note: Accessories available include hoist, trolley, tagline, anchor bolts, templates, rotation stops and collector ring assemblies. Motorization Kits are available for new and existing cranes. 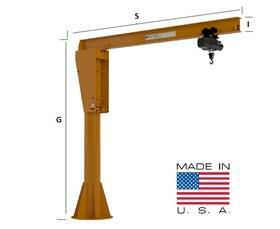 Galvanization, epoxy, and food grade adders are available on all jib cranes. Contact us for pricing. See Related Items tab for Pillar Base Mounted Jib Crane Accessories and Motorized Rotation Kit for New and Existing Heavy Duty Jib Cranes.